In December, 40 of AAE’s Kabul students took a field trip to Bagh-e-Babur in Kabul. Bagh-e-Babur, or the Gardens of Babur, is a historic park and the final resting-place of the first Mughal emperor, Babur. It was built sometime around the year 1528 AD (935 AH). Bagh-e-Babur is a popular tourist attraction and many people in the city visit every year. 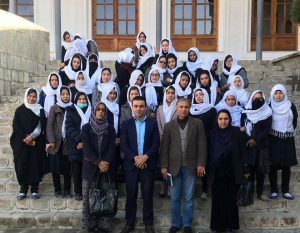 But at AAE, when we take our students on educational field trips, many of them have never visited places like the Kabul Museum or Bagh-e-Babur, despite living in Kabul for most of their lives. Why would that be? If an adult woman, like our 11th-grade student Shakila, has lived out her 54 years in Kabul, why has she never visited major Kabul attractions like Bagh-e-Babur? 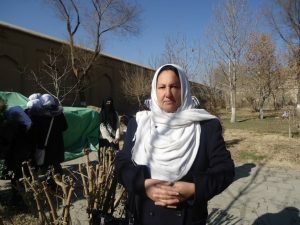 “Social and economic barriers prevented me from making a visit to Bagh-e-Babur before,” Shakila explained. “I had heard the name Bagh-e-Babur many times, but I am so thrilled that I am here for the first time in my life.” Shakila is the mother of 7. Between raising them, providing for her family, and now going back to school, there isn’t always time for taking trips. Societal expectations of Afghan women can prevent them from leaving the house by themselves or traveling freely. When they are out, women often face harassment, explained Sadaf, our 19-year-old 12th-grade student. She had visited Bagh-e-Babur before but was very happy to visit with other students. “When you are in a school uniform with your classmates, you feel secure because everyone knows you are a student and men do not harass you by giving you strange looks,” Sadaf said. We understand that education does not just take place in the classroom. Our students want to get out the door and into the world and we’re honored to help them do that. Through education, they become empowered by learning their rights and realizing nothing can hold them back. Today, on International Women’s Day, we hope you’ll join us in making sure our students always have access to new avenues of exploration. Who knows where they’ll go next!